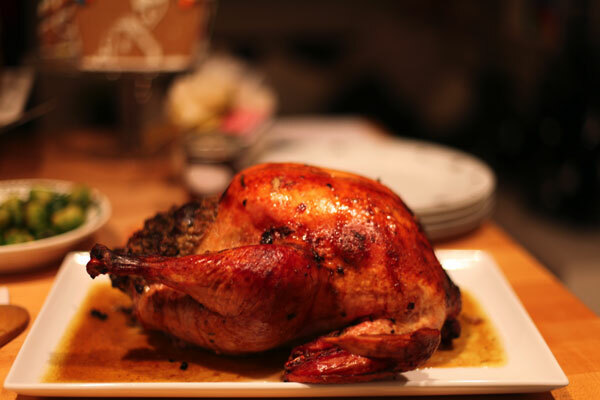 Imagine being able to invite Todd English to home to cook your Thanksgiving turkey – well this is as close as most mere mortals will ever get to this. When we met to discuss recipes, and for English to show me how to make up his dish, he was concerned that this recipe was a little too challenging for a home cook – but I disagree. By cooking the turkey in pieces it takes all the stress out of cooking a large bird – almost impossible to get right by even the best chefs, because white and dark meat cooks at different times – you may have an amazing looking bird to present to at the table but you either have dry breast or under cook thighs and legs. While still a student at the Culinary Institute of America, English landed a job that would be integral to his early education as a chef. 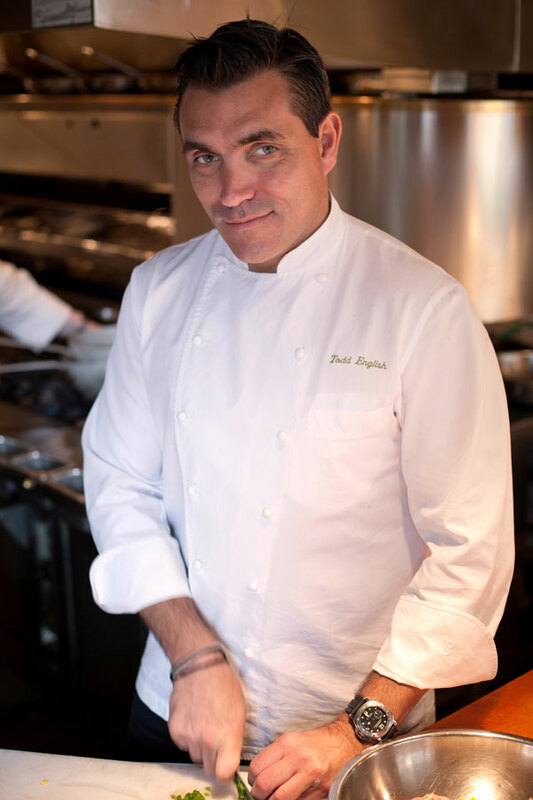 “ I was in the dorm, and the phone rings, a thick French accent at the other end asks for Todd English and says to me, “Okay, you start on Monday”—click.” The Frenchman at the end of the phone was my father-in-law chef/owner of La Côte Basque Jean-Jacques Rachou. The following week English began working in this top New York restaurant. It is here that he perfected the French technique of confit, cooking the duck that went into the award winning cassoulet. “I feel like I got my bachelor’s degree at the Culinary Institute of America,” says English. “And then I went out into the world and got my masters, and I’m still working on my PhD —it will never end for me because there’s always something to learn about food around the world.” He’s currently fascinated with spice. English’s “masters” involved building a giant multimillion-dollar brand. He has opened a long list of restaurants around the country and beyond, beginning with Olives in Charlestown, Massachusetts in 1989, and has broadened his empire to include airline and cruise ship food, books, television shows, non-stick cookware and even a line of frozen pizzas. Interestingly, it’s this success that has led some to publicly question whether he’s “sold out.” English’s answer to this is quite clear, he doesn’t want to end up burnt out by the drudgery of working in a restaurant kitchen turning out haute cuisine day and night. He’s seen it happen to too many of the previous generation of chefs who taught him. The lesson he learned from them might well have been something they didn’t realize they were teaching. It wasn’t that he couldn’t stand the heat, but that he saw a niche to do so much more if he got out of the kitchen. Known across the country as the centerpiece of the Thanksgiving table, roast turkey is as close to a national dish as America gets. The early settlers discovered and cooked up the bounty of the New World—wild turkey, venison, fish, clams, lobster, pumpkins, blueberries, nuts, corn (as meal in cakes), and cranberries—but it’s unlikely that they enjoyed the bird as we know it today at the first Thanksgiving feast. For one thing they didn’t have ovens, the turkey would have been spit roasted—if it was eaten at all. The pilgrims referred to all wild fowl as “turkey,” so they could have dined on duck or goose and still called it turkey. Last year when it was just four of us for Thanksgiving I cooked up an organic roast chicken and convinced the children it was a small turkey. I had no idea how close I was to the pilgrims. English breaks his turkey down, and cooks the dark and light meat separately, stuffing and roasting the breast, and slow cooking the legs and thighs in fat to make a confit. Though there’s no big roasted bird to present to the table, this method ensures both the light and dark meats are perfectly cooked, and the slices of breast are so elegant with the stuffing at the center no one will complain. 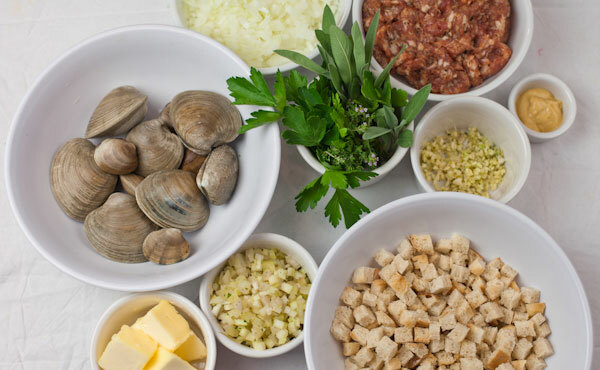 English’s stuffing includes clams, a nod to New England, and is served with lots of rich brown gravy. We used to say “swimming in gravy” when I was younger, and the olive gravy is just divine over the crispy golden stuffing and juicy meat. By using the technique of confit to cook the turkey legs, the brown meat is moist and succulent. Don’t be put off by this fancy sounding technique or the fact that the meat is cooked in fat—it’s relatively easy and the finished meat isn’t greasy or ladened with fat. The confit is then baked in the oven with some of the stuffing to to turn the skin crisp and golden. 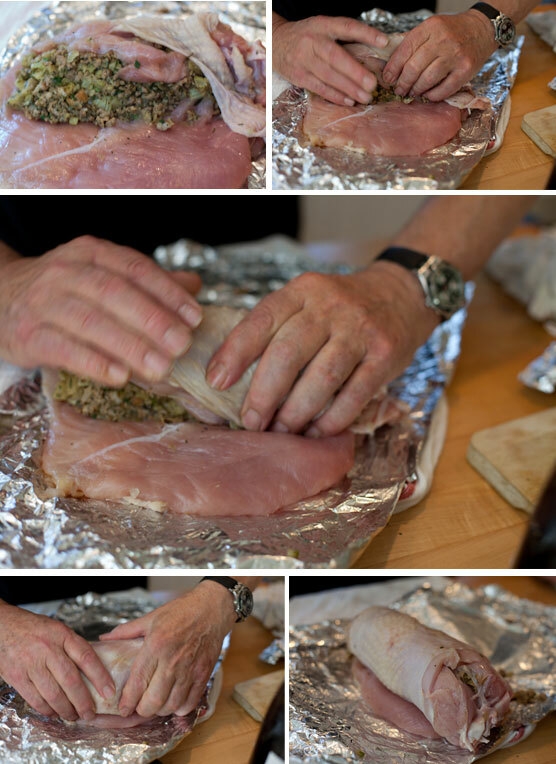 The hardest part is probably learning how to truss the stuffed breast meat with butcher’s twine—it takes a little practice but you’ll be so pleased with the results. Then there’s that all-important question of oven space and timing, plan ahead and you will be fine, the confit can be cooked a day or two in advance. Although we can’t be sure that turkey was part of the first Thanksgiving feast, clams, lobster and fish most definitely were. Oysters were added into sauces and stuffings in the late eighteenth and early nineteenth century. Originating in the South, probably stemming from the French influences in New Orleans, oyster sauce spread up the Eastern Seaboard to New England. Amelia Simmons has two recipes for stuffing turkey in American Cookery (1798), but no mention of seafood. By 1824 Mrs. Randolph in The Virginia House-wife includes a recipe to boil a turkey with oyster sauce. Estelle Woods Wilcox includes a recipe for “English Roast Turkey” in The Buckeye Cookery (1877), and includes a garnish of oysters. 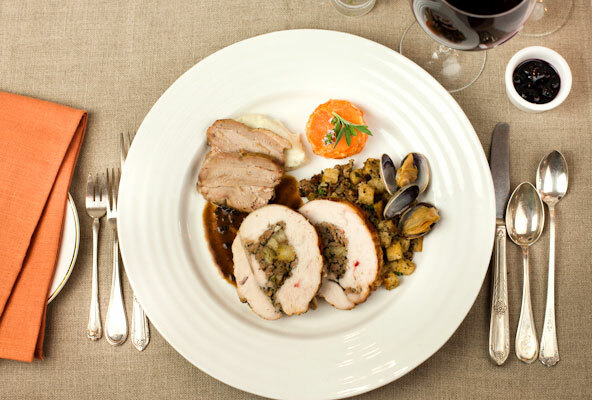 We’ve come a long way with this Todd English roast turkey with confit legs, clam stuffing and olive gravy. Part of the trial of cooking a large turkey is getting the white meat and the brown meat to be cooked and ready at the same time. English breaks down the bird and cooks the legs confit, once you have tasted how succulent and juicy it is you will never roast the whole bird again. The breast is rolled up with the stuffing in the middle—keeping the meat moist and it’s so pretty on the plate once sliced. It’s not a true Thanksgiving without all the extra flavors on the plate. In the coming weeks I’ll be sharing Thanksgiving recipes from MADE IN AMERICA: Stephanie Izard’s sweet potato gratin, Bill Kim’s Brussels sprouts with chorizo and Daniel Boulud’s celery root puree because everyone wants turkey with all the trimmings. For dessert I will be posting Richard Ruskell’s pumpkin pie, Evan Kleiman’s Apple Chess Pie and Alex Seidel’s bourbon pecan pie with butterscotch sauce drizzled liberally on top, cook one or other or all! 2. In a medium saucepan melt the duck fat. 3. In a skillet heat 2 tablespoons of the duck fat over medium heat. In a medium bowl, toss the turkey legs with the garlic, onion, herbs, lemon, carrot and pepper and transfer to the skillet. Sweat the vegetables and turkey legs for 4 to 5 minutes. Place the turkey legs in a single snug layer in a high-sided baking dish or ovenproof saucepan. Pour the melted fat over the legs, then the olive oil, and then place in the oven. 4. Cook slowly at a very slow simmer — just an occasional bubble — until the legs are tender and can be easily pulled from the bone, about 2-3 hours. 5. Remove from oven and let cool to room temperature in the pan. 2. In shallow baking pans arrange the bread cubes in one layer, bake in oven for 10 to 15 minutes, or until they are golden, and transfer to a large bowl. 3. Heat a large skillet over medium high heat and sauté the sausage, breaking it apart with a fork as it cooks. Remove with a slotted spoon and discard all but 2 tablespoons of the fat. Add the garlic, onion, celery, thyme and sage over moderately low heat, stirring, until the vegetables are softened. Transfer the mixture to the bowl with the bread. Add the mustard, parsley, melted butter, Littleneck clams, sausage, salt and pepper to taste, toss the stuffing well, and let it cool completely. 1. Butterfly each breast and season with salt and pepper. Stuff each with 2 cups of the stuffing and roll up. Seal edges with metal skewers or tie with butcher’s twine. 2. Preheat the oven to 375 degrees F.
3. Place onions, carrots and celery in bottom of medium roasting pan. Nest the clams in the vegetables. Add the stock and 1 cup of the white wine. 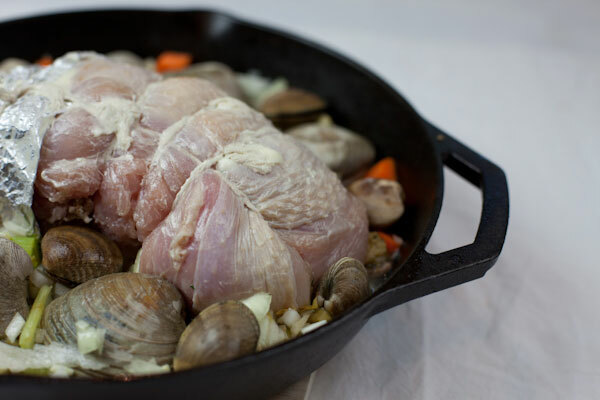 Lay the stuffed turkey breasts on top of vegetables and quahog clams and cook 1 to 1 ½ hours or until internal temperature of 155-160 degrees F.
4. Remove breasts and set aside to rest. Pour any liquid from clams back into pan, discard clams. Drain excess liquid through a chinois or fine mesh sieve and set aside. 5. Add maple syrup to vegetables in the pan and mash. 6. Deglaze roasting pan with the remaining 1 cup white wine and reduce by half. Remove the fat from the reserved liquid, then add back into pan with roasted vegetables and simmer for about 2 minutes. 7. Finish gravy with olives and rosemary, season with salt and pepper to taste. 1. Heat the oven to 375 degrees F.
2. Discard the vegetables, bay leaves and excess fat from the turkey confit. 3. Place remaining 4 cups of the stuffing in a shallow baking dish, top with confit legs and bake in oven for 30 minutes, or until confit is golden brown and stuffing is crispy. 4. Carve turkey breasts into ½-inch-thick slices and serve the confit and stuffing alongside. 5. To finish, sauce the breasts with the olive and rosemary gravy. Ok, so Todd English is way handsome AND so is his stuffed turkey! One of these days, I am going to make ALL of this… and it is going to be awesome!! Sadly, this won’t be the year… but I know it will be so darn tasty that I am simply going to have to make this! I usually find “alternative” Thanksgiving turkey recipes kind of annoying, but this looks REALLY good! 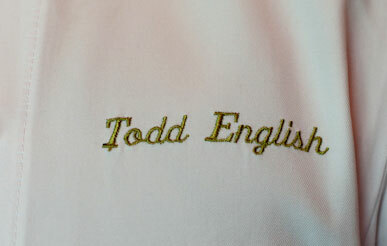 I wouldn’t mind having Todd English in my kitchen sharing his tricks, either! 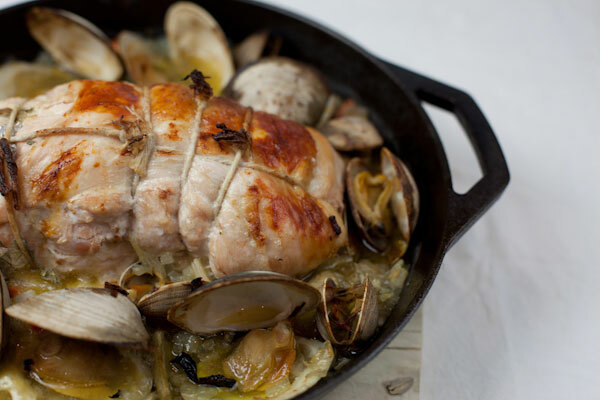 Couldn’t agree more on the alternative turkey recipes – but this is more elevating of a classic – mighty tasty – plus I love the addition of clams to the stuffing – which the pilgrims would more likely have eaten. A gorgeous recipe and photos! I used to make turkey confit when I lived in France and it was always a major hit.